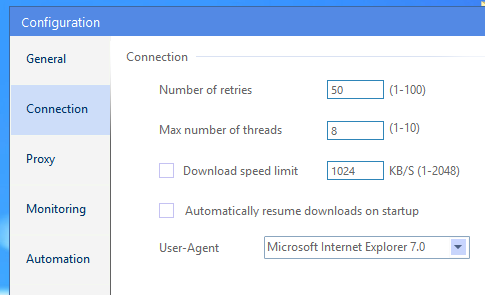 ‘EagleGet’ is a new download accelerator for the Windows platform, and the best thing about it is that it is completely free to use!. It is currently in beta stage and I have only tested it in Windows 8, but it should run in other Windows versions (7, Vista etc) and supports popular web browsers such as Google Chrome, Mozilla Firefox (test in ’18’), IE etc. Not only the usual downloads, ‘EagleGet’ also has the ability to let you download streaming audio & video content from websites such as Facebook, Dailymotion, etc. But please be aware that, not all these websites permit one to download their streaming multimedia content, unless the author has given the permission (take ‘YouTube’ for instance). 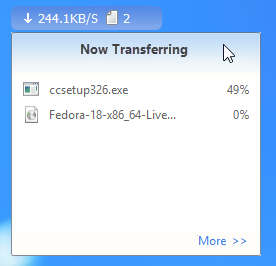 Anyhow, you can change the maximum number of threads (connections) when downloading a file (this actually depends on the website where the file is hosted), ‘retry attempts’, limit download speed manually, setup a proxy, change the ‘user-agent’, ‘Pause’ and ‘Resume’ downloads (of course), has a floating ‘download monitor’ that shows the current transfer speeds and files in the list and more. It monitors your clipboard & the browser, and adds downloads to its list automatically (links can be added manually too), starts with system start-up, gives notifications when tasks complete, shows the downloads in categories, ‘Task Cleaner’ button for easily removing files from the list etc. You can also bypass ‘EagleGet’ by pressing the ‘Alt’ key while clicking on a link, but that option is disabled by default. Though it is still a beta software, it ran pretty smoothly in Windows 8 plus, I also like its simple & user friendly interface as well. However, it has a fixed minimal window size and does not let you decrease the size beyond that. And that is my only complaint at the moment :). If interested, then please visit this ‘EagleGet’ home page and download it. It will close your web browser while installing, and if it was Firefox, then next time you open it, it will ask your permission for enabling the ‘EagleGet’ addon. So make sure to click on the ‘Allow this installation’ check-box for finishing things up. Good luck. How to Install SMPlayer 0.8.3 on Fedora 18?